I came up with a few Pink party ideas for Pink Saturday! I think the chocolate will taste even better coming out of a pink fountain. This is a homemade pinata...how cute is that? How about a pink limo to take you to your celebration? 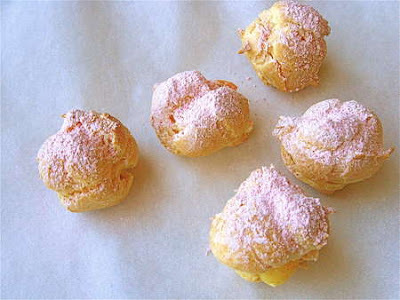 Yummy cream puffs with pink sugar. Great for a fairy tea party. I think I will go and get a piece of this pink cake and visit the rest of the great pink posts at Beverly's. Won't you join me? :-) What a party it would be with all the pinks. I like cream puffs very much! LOVE that pinata! Looks like a pink scrubbing bubble! I love a good old fashioned no-cares-about-the-calories party! would it be possible to tilt that fountain just a tad and let me lie under it with my mouth open and holding a sponge cake napkin? I've never seen a limo that colour - it would most definitely stand out on your way to the party! That pinata is adorable!! And of course the food looks delish! Have a great Pink Saturday!!! Love the pink cake! Yummy! Now I am ready for a PINK party! Love that pinata! This has to be one of the best days of the week for a dyed-in-the-wool pinkie like me. Your sharing this week is w♥nderful. Thanks so much...warmed me up...it's -6 outside and I need all the warmth I can get! I think my pinanta is my favorite among today's pinkies. Isn't that cute? But I would like to take a ride in that pinkest of cars! Love your ideas for Pink Saturday! 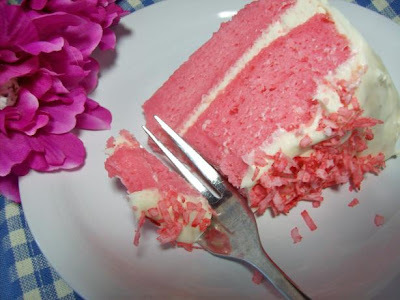 When I was a little girl, pink cake was the absolute best for a party. Love your Breakfast at Tiffany's party! Oh, what fun! I would like a slice of that pink cake, too. It looks delicious. Now that's my kind of party! 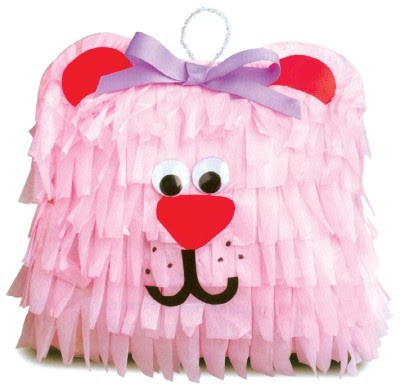 I might try to make the pinata for my daughter's next birthday! You definitely have some yummy pinks there! Hope you are having a delicious Pink Saturday? Did you save some of that cake for me? Just what you need for a great PINK PARTY! Ha! I absoloutly love the pink puffs Mmmm! 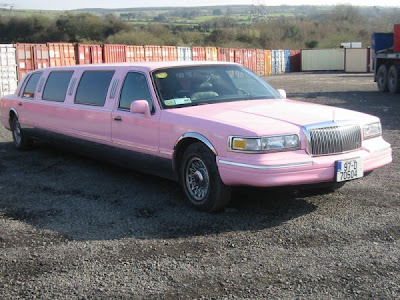 I love anything pink and am hoping to get a pink limo for my hen party! Im all in as far as the homemade pinata...my grand kids would love that! I hear you will be having a visitor soon! I look forward to seeing her adventures with you. 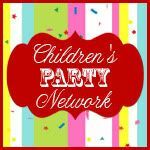 Looks like she will be picking up some great party ideas from you and your lovely blog. I enjoyed your pink party ideas especially the pink limo. Everything is always better in pink! Love the pink limo! Oh, that pink cake looks "pinkalicious!" I just might make one today in honor of Pink Saturday. Yum! Now that some pink! Great Assortment of Pinks. Hi Tricia, What a lovely site! It brought back memories. When I was young, like 50 years ago, my mother ALWAYS made me a pink birthday cake. It always seemed to me to have a pink taste...so much better than vanilla. Thank you for the beautiful memories this brought me.